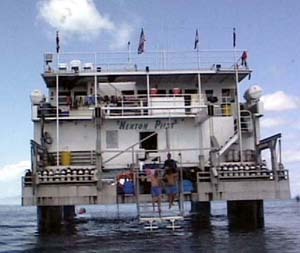 The Nekton Pilot is a very interesting Liveaboard. My room was very comfortable with two portholes, a large closet, shelves for everything, a queen size bed, which my wife and I found very comfortable, and a private bathroom with a shower. The dining area is spacious, with windows open to the sea, and the food is excellent. Near the dining area is a roomy alcove with games, books, and a tv/vcr with many videotapes. There were nightly lectures with slide shows. On the last night there was a slide contest for all onboard photographers. The entire staff is friendly and helpful all the time. The diving was excellent. The reef in Belize is in great shape, and life abounds. Your dive gear is stored in a cubicle directly beneath your 95 cc tank. 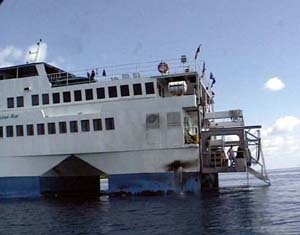 Only a few feet away is the dive platform, where you enter the water from just a few inches above sea level. On the top deck there are many deck chairs, a Jacuzzi, and rods and hangers for skins and wetsuits. Even though we did 5 dives a day, my skin and shorties were dry and ready to go for each dive. The experience of the Nekton Pilot was totally enjoyable. 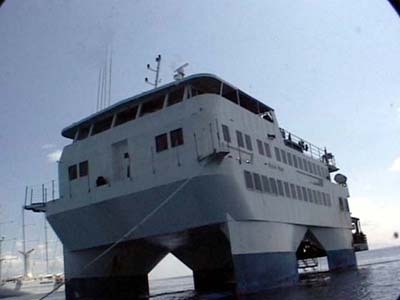 During the trip we visited Long Key, Glover's Reef, Lighthouse Reef, Tarpon Caves, Que Brada and Tourneffe Reef. We saw healthy coral, sponge and fish life at many sites in each area. Tanks are left on the hang line for those of us for whom 95 cc still isn't enough oxygen for a dive. On more than one dive, there were hundreds of Jacks waiting under the Nekton to be viewed while hanging on the line. On one dive an Eagle Ray passed right by the ladder while I waited on the line.